This research paper shows how digital streaming services have enabled a healthy revenue increase for legacy music players, such as major labels and collecting societies, in addition to fostering creativity and choice. “In the first half of 2017, wholesale revenues [of the US record industry] increased by 14.6% to $2.7 billion. Retail revenues from streaming platforms grew from 48% to $2.5 billion, including revenues from ad-supported streaming platforms which grew 37% over the same period,” Sacquet wrote. Digital music is also driving the growth of collecting societies’ revenues as, between 2010 and 2015, “close to half of the growth in collecting societies’ income came from digital”. This paper highlights as well that, in absolute terms, “Europe is the highest contributor to collecting society revenues globally”. “Part of the debate over European copyright reform focuses on the idea of a so-called “value gap”. 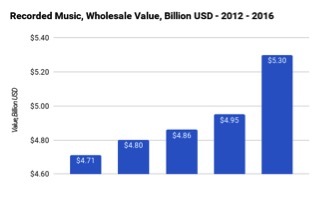 This research paper demonstrates instead healthy rises in revenue for legacy music players and that digital streaming services enable massive value growth”.